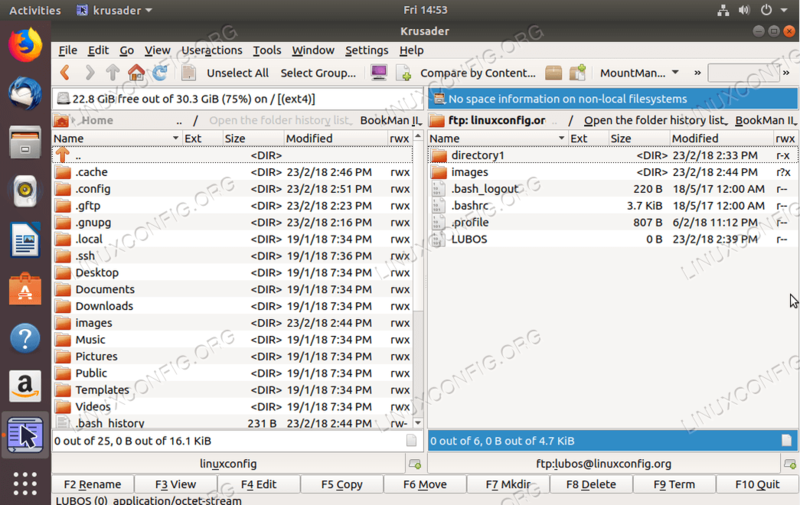 The following article will provide a list of FTP clients for Ubuntu 18.04 Bionic Beaver Linux as well as installation and basic usage instructions. Use the FTP client for transferring local files to the remote server using various protocols. Some FTP clients for Ubuntu operating system have a basic functionality hence supporting only the FTP protocol whereas many other FTP clients support multiple protocols such SFTP, SMB, AFP, DAV, SSH, FTPS, NFS and more. The choice of selecting the best FTP client for Ubuntu 18.04 depends on many factors. This guide will list FTP clients with a substantial amount of features as well as it will also provide information about small but powerful command line FTP clients. 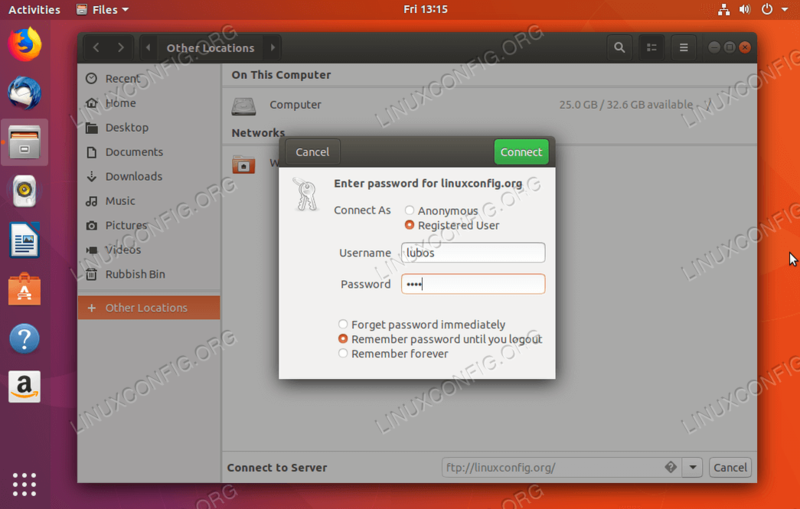 The first FTP client for Ubuntu we are going to introduce is Nautilus. If you are using a default Ubuntu 18.04 Bionic Beaver GNOME desktop, you do not need to look further than that as Nautilus is already installed on your Ubuntu system. 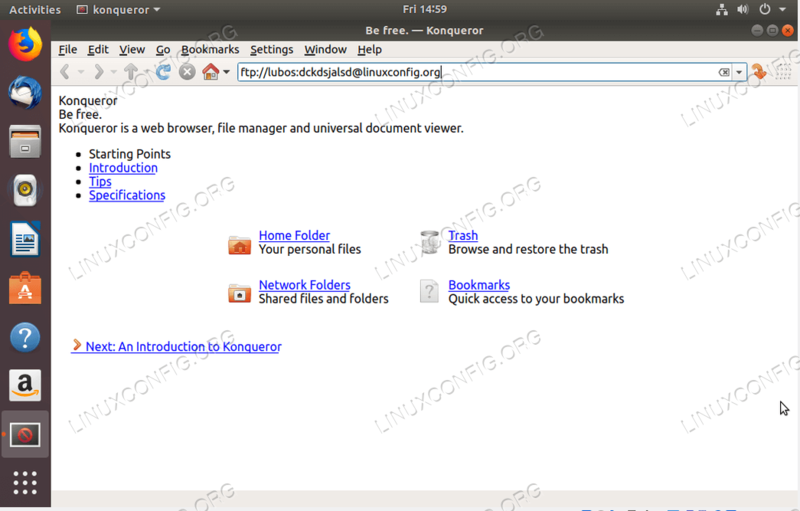 Nautilus is a file manager. However, one can use it as an FTP client as it supports multiple network protocols. It has "drag and drop" file functionality and is very intuitive to work with. To initiate a new FTP connection click on Other Locations and fill in Connect to Server box. Depending on what protocol you wish to use enter either ftp://, sftp etc. Once you hit Connect you will be asked for FTP user credentials. Once ready hit Connect to initiate new FTP connection. The interface is rather intuitive. To create an FTP connection to your server enter your FTP server's hostname or IP address, your credentials and optionally network port you wish to connect to. FileZilla is rich in features. Despite of gFTP simplicity, this FTP client offers multiple features and supports number of network protocols. The Krusader is my personal favorite. It is a Swiss knife for managing files. Krusader is a tool for every occasion, by default it supports only the FTP protocol. For SFTP and other network protocols support install the kio-extras package. To create a new FTP connection on Krusader navigate to Tools->New Net Connection... or simply press CTRL+N. Select protocol, insert your FTP credentials and FTP server details. If you are familiar with the antique Norton Commander from the olds days, you should feel almost at home here. Creating FTP connection with Konqueror as an FTP client could not be easier. To create an FTP connection from the command line using the ftp command simply enter: ftp FTP-SERVER-HOST-OR-IP. Once prompted, enter your user name and password. To create a new FTP connection with NcFTP enter: ncfpt -u USERNAME FTP-SERVER-HOST-OR-IP.